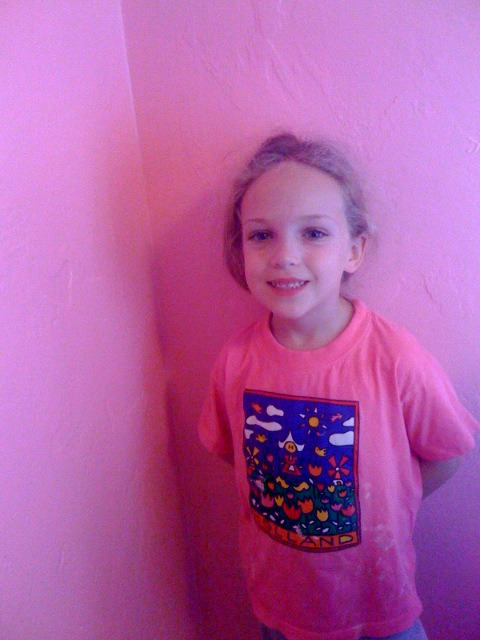 Last weekend, we painted Annabelle’s room. It was part of her 7th birthday present. Now that I have a 7-year-old, it occurs to me that most of my childhood memories begin at 7. I have a few, from before that. I remember peeing my pants the first day of kindergarten (that was fun) and getting upset because I accidentally threw out my lunch bag with the penny change from buying milk in the cafeteria (yes, kids, back in the olden days, a single-serving carton of milk cost 4 cents!) and confessing to my parents. I have some vague memories of the first house my parents owned, but most of those are likely from snapshots. But everything went technicolor when we moved into our second house, the one I lived in through high school. I was 6-almost-7, entering 2nd grade. I remember losing the school poetry contest to Kari Bookbinder (her poem WAS better) and a lot of things about Hopi Elementary School but mostly, when I think about 2nd grade, I think about my childhood bedroom, the one in our then-new house. I wanted a pink room. I know that’s nothing original. Every girl goes through a pink phase, right? I’ve never asked her, but I’m guessing my mother never did. As long as I’ve known her, she’s been all about blue. That’s something I really admire — loyalty to a hue — since my own tastes have wandered over time. I did go through an anti-pink phase for many years, probably associated with my time at a womens college, but in my adult years I’ve embraced it, reclaimed it, celebrated it, sort of like some women like to reclaim the c-word. But not quite. The truth is, I just like pink. So does Annabelle. 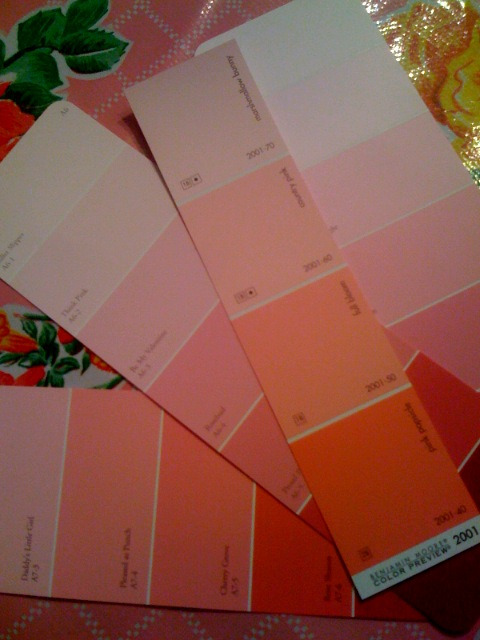 So when she wanted to paint her room pink, I said sure. My mom was horrified. Mainly because she thought it would be hideous. But also, I’m certain, because she remembered refusing my own similar request at the same age. To be fair, the woman did let me choose my own bat mitzvah outfit, which unfortunately wound up being brown velvet and gray faux silk. It’s not like she didn’t celebrate individuality or creativity. 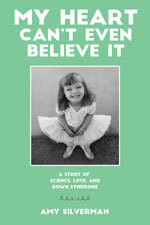 But when it came to something somewhat permanent, like the wall colors in a room in her brand-new house, no way. And I have to give a nod to my mom, then and now — she’s always had the best taste of anyone I know. So I’m certain she was right about the pink then. And now. My request for pink walls was also nixed. I got a green accent wall. To this day, I hate the term “accent wall”. My mom did buy me pink flowered bed spreads. It wasn’t a bad room. It just wasn’t pink. When I was pregnant with Annabelle, I found some super-cute Pottery Barn crib sheets on eBay: hot pink with smiling mermaids and bright green accents. Not thinking about my childhood room, I had the nursery painted green to match the sheets. My mom was nice enough to not say anything, but other people did. Everyone who walked into that room in the 7 years it was green sucked wind; it was pretty bright. I never did like it, so when Annabelle announced she wanted to paint, I was thrilled. Ray insisted on doing the job himself, so the girls and I were dispatched to Ace Hardware to get supplies. My mother, who had been lobbying Annabelle for weeks with the term “ballet pink” (figuring she could mitigate damages) desperately wanted to come along, but she wasn’t able to make it on the night we hit the hardware store. She sent me off with all sorts of advice and warnings. 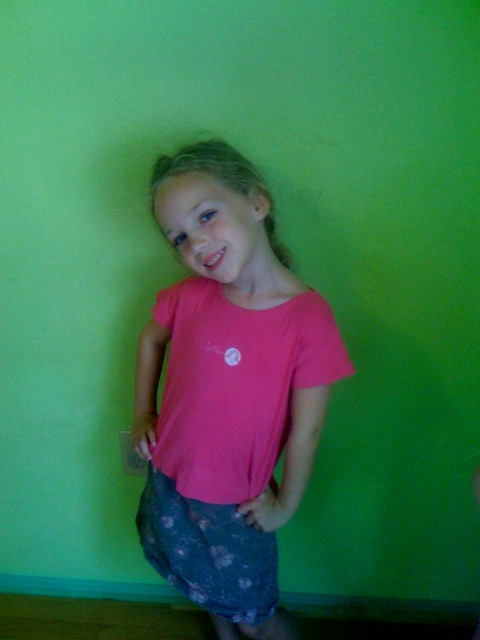 But when we got to Ace, Annabelle announced she did not want ballet pink. She wanted PINK. I pulled a few samples and let her choose. She chose a shade called “Full Bloom”. We filled our cart. Two days later, I shoved all her junk into the middle of the room, and Annabelle and Ray painted. Sophie wanted to help, but things were getting ugly, so she and I were sent to Target and the grocery store. Here I will admit that I treat painting the way I treat writing. I go gung-ho, and I don’t like revising. In paint terms, that means I refuse to bring home samples, to make sure that’s really the shade I want. I just go for it. Maybe that’s not the best idea. There is no equivalent to blogging, in painting. If there is, it happened in Annabelle’s room last weekend. Halfway through the process, our friend Deborah stopped by. She poked her head in — and back out again. “WHOA,” was all she said. But here’s the thing. Annabelle is THRILLED. She loves her new room. So what if it glows? The pink glow is better than the green glow, and we can always repaint — someday. Sophie’s in line first. At the hardware store, she announced she wants to paint her own room yellow. (Or, as Sophie puts it, “Lellow”.) As soon as she said it, I felt instant empathy for my mother, because I hate yellow. There is no freaking way I’ll ever let a room in my house be painted yellow. This took me back to when I wanted to paint my bedroom blue. My mom was open to different colors, as long as they were white. Embassy White, Navajo White, Linen White. Boring. Boring. Boring! I wanted BLUE. Nice medium blue. Her “compromise” was so pale, I can’t remember what it was called, but Fat Free Milk Blue would have been appropriate.